Where is LEA? - LEA Designs - aka: Alien Headquarters! LEA Designs - aka: Alien Headquarters! While many vendors cop out and sell inflatable green aliens and hairband antennae, some offer more unique crafts. 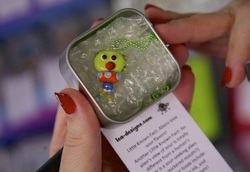 Tiffany Williams, for example, was selling "Adopt an Alien" jewelry. Each alien is unique and has a name like Frigginstankle or Dr. Brikenshloop, as well as a detailed and individualized back story. You have to admire that level of dedication." Just a quick note - Dr. Brikenshloop has been adopted but Frigginstankle still needs a home! If these aliens aren't in your ears or around your neck (or on the body of a loved one) then that means they are in my house! And although I love them, they are driving my husband nuts! So please ask your favorite gift shop to carry LEA's aliens, and who knows - maybe you could even save my marriage.